Quilting Adventures: Eggplant Parmesan ...! I love eggplant parmesan! But not cooked the traditional Italian way. Most restaurants cook it in lots of olive oil and the eggplant acts as a sponge soaking the oil up .... yuk! I like to bake mine and it comes out nice and crispy on the outside! 1 Eggplant - Sliced 1/4 inch thick. Beat the egg and milk/cream together in another bowl. I tend to prick my eggplant slices before I dip them in the egg and milk bowl. Place on a cookie sheet lined with parchment paper. I just love King Arthur Flour pre cut half sheets parchment paper! Bake at 350F for approximately 40 minutes. In 20 minutes, turn the slices over and place back in the oven for another 20 minutes or until done. I use the bake feature on my oven, as I find that convection does not brown as well. They are now ready to enjoy! They freeze very well. I tend to buy a large eggplant, and place the left over in a container and pop them in the freezer. It truly makes sense to make a large batch. As for the left over bread coating ... I bag it and place it in the freezer for the next batch. Time for dinner ... Enjoy! To finish it off do you add a marinara sauce and top it with mozzarella cheese? It looks delicious. My hubs has never been fond of eggplant, but maybe crispy will convince him. That looks delicious, I do miss italian, the type with cheese, lol. 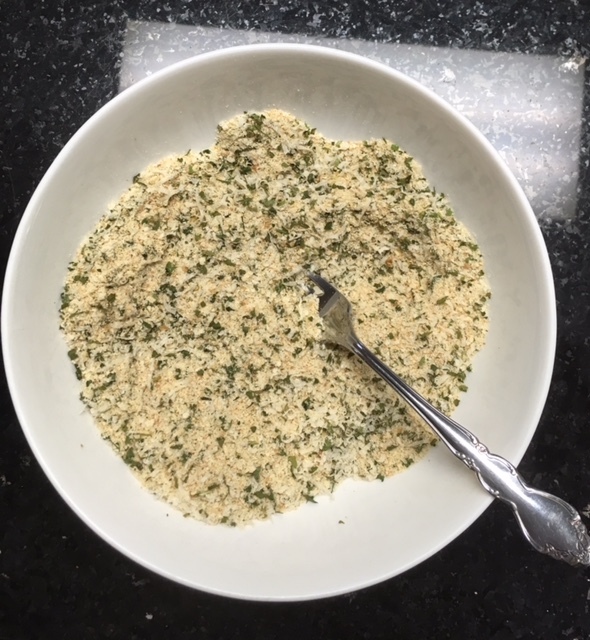 I can make my own sauces for spaghetti and I make my own bread crumbs, but no cheese dishes. Your new quilt is going to be beautiful.